These beautiful wooden stacking blocks are handmade with each one uniquely crafted. They are perfect for encouraging focus and exploration, grasp and release patterns, eye hand coordination, problem-solving and more. Baby Animal Toy Rattles come with suction cups at the bottom that attach to any flat surface. The rattles are easy for a baby to manipulate, and the sounds are super engaging. 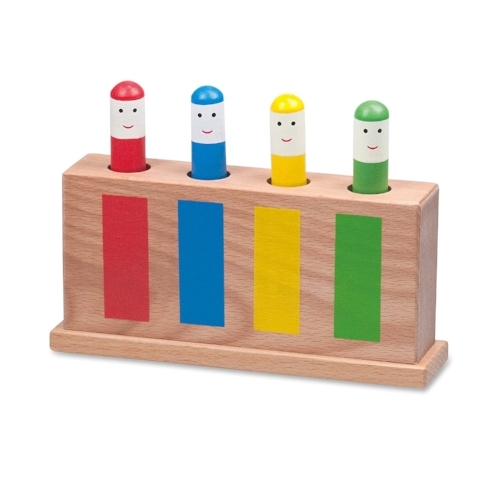 Playing with these encourages focus, promotes hand-eye coordination and introduces cause and effect. They are also perfect for travel. Indestructibles are books that are specifically built for babies. They don't tear, rip or bend, and are dishwasher safe. This book is a story about a baby's day at the beach. Bolli is a cool teething toy that could be stretched, squeezed, and inverted. It's perfect for promoting tactile exploration and feedback, and encouraging motor skill development. My First Fidget Cube comes with 6 sides of of unique activities for a baby to explore. Playing with it promotes motor development, teaches cause and effect, and encourages tactile exploration. Love it! Rubbablox are made out of a soft natural rubber foam that is uniquely textured (feels soft and fuzzy). Playing with Rubbablox encourages eye-hand coordination, strength, attention, and creativity. They come in a set of 9 blocks and 14 connectors. Manhattan Toy Atom is a rattle and teething toy in one. The rattle rings slide back and forth, and the stems are soft and flexible. This toy is great for encouraging bilateral coordination (using two hands to grasp and manipulate), fine motor skills, and tactile exploration. The Fox Spiral Hanging Toy can be used to easily wrap around crib rails, strollers, swings, and baby seats. It is made out of different textures and makes various sounds that provide tactile and auditory sensory input. The spirals also encourage a baby to reach, pull, and grasp. This cute pop-up toy teaches cause and effect, encourages finger isolation, and promotes hand-eye coordination. It's simple but super fun. This Clutching Toy Star is another cool teething toy that comes with different textures to provide tactile input to the hands and mouth. It is soft, bendable, and motivating for baby to grasp and reach.